Both contain the same content. I didn’t believe in color banding. I trusted some half-knowledge for years and now I write about it so that you don’t make the same mistake. I’ll explain what color banding is and that texture-compression might look very similar – it’s important to recognize the difference to choose the right tools to fight it. But first I’ll give you a short overview why I got trapped in half-knowledge. I was like the dudes above when it came to Color Depth. With 24 Bit per pixel (smart people say 24 bpp) you get freakin’ 16.7 million colors! 24/32bpp is just the sum of 8bit for every of the three color channels (red, green and blue) and maybe an alpha channel. 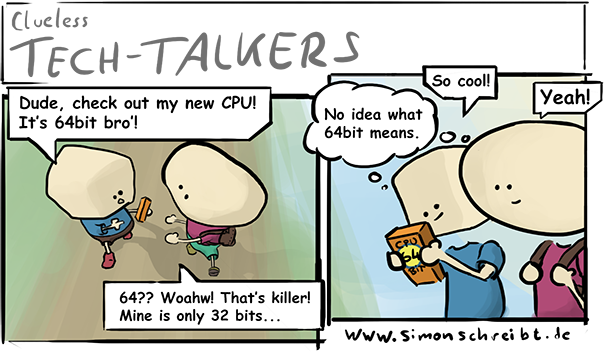 That’s a maximum of 256 colors per channel – doesn’t sound that much anymore, right? And if you now imagine a gradient reaching from black to white on a monitor with a resolution of 1920 pixels width you’ll quickly learn that you have to stretch your 256 colors so that you get ~8 pixels wide color bands (1920 pixels / 256 colors = 7.5 pixels per color). 8 Pixels isn’t that much but most times you don’t have gradients going from one extreme to another. Here’s another gradient with only 30 shades and you can already see some banding. If the problem really depends on the limitation of colors (and not from texture compression which is explained later) you can’t magically create more of them but you can use Dithering to hide the limitations! What this basically does is shown below. I guess especially Retro-Pixel-Artists do such stuff every day but isn’t this amazing? What a great way to hide the actual color limitation. It looks like Color Banding but it’s not! If you have more examples like these, feel free to let me know! In the upper case you can’t do much but it gets ugly when game engines use compressed texture data (should be almost always the case) which means for DXT1 for example that the texture will have 65536 colors (16bpp) instead of the possible 16.7 million (24bpp) and get some compression artifacts. The good news: The texture will need way less memory and most of the times still look pretty good. But if you actually notice that in THIS case it is the compression which steals your colors, you can fight against it! You can read this article which describes really well how to optimize your image so that it looks well even with compression by using noise and precise color shifts. 2. No way. No compression. If you have control over your pipeline you could not compress this special texture to avoid any compression artifacts and color shifts. This costs more space but if your texture isn’t too big and you don’t do this too often, it should be fine. Even if the texture is small and therefore contains not many color information, the graphic card will interpolate the values in-between very well. 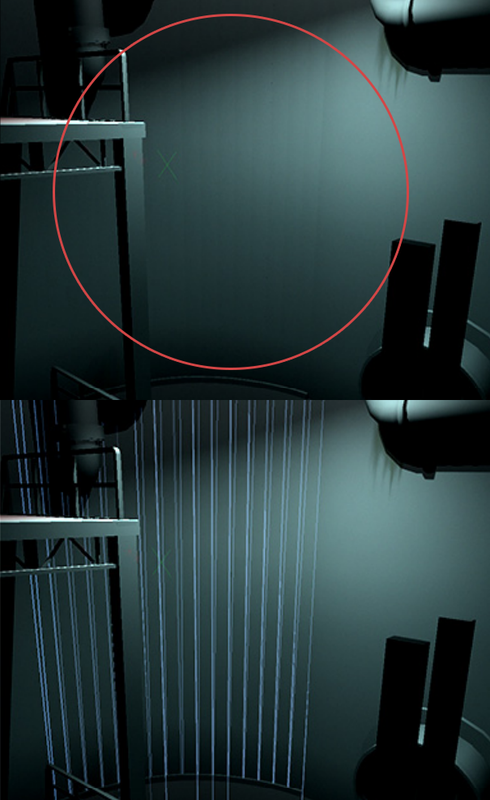 That’s why even small (uncompressed) textures work well for gradients. Actually it’s really interesting that these color shift happen because not every color channel gets compressed with the same quality. With DXT1 for example the green channel gets 6 bit while red and blue only get 5 bit (makes 16 bit in total). This is because the human eye is more sensitive when it comes to green values. And not to forget, the backgrounds in Homeworld were done via Vertex Color too! I wrote about this here. Thank you for reading and let me know if you like the content of this article or if something is wrong or needs to be added. 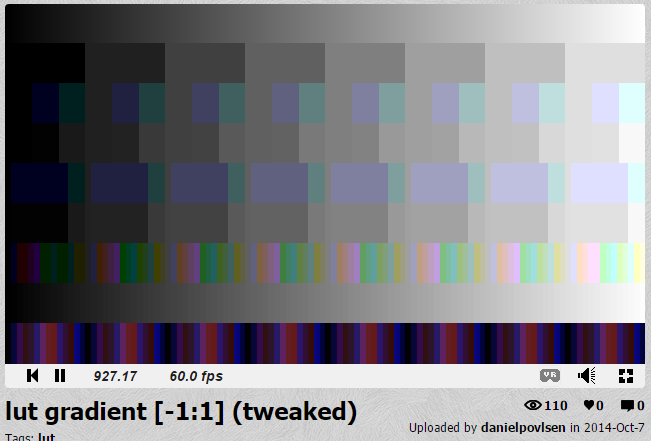 Thanks MrEiwe for this link about hardware-dithering and framerate control in monitors. And here’s a huge article about realtime-compression and a lot explanation about DXT – Thanks for the link p1xelcoder. At the top you see a standard color gradient (increased contrast for better visibility) where gray values are brightened up by adding +1 to all of the RGB channels. At the bottom you see smaller color stripes where first the green channel gets +1 and then the blue channel. Of course this creates color where you intend to have only grey values but seeing it from far makes this detail less prominent. Here’s an example with 1920 pixels width (click the link or Right-Click on the image and choose “Open in Tab”). 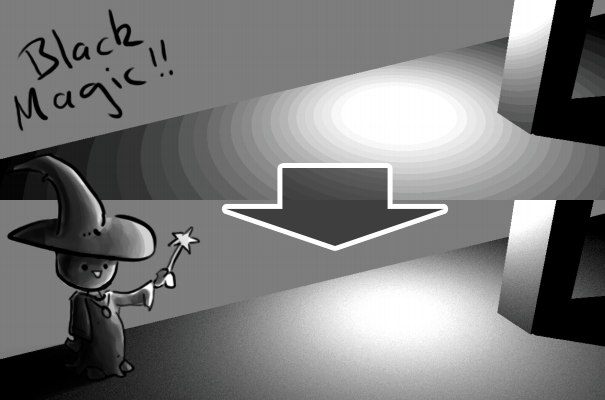 The upper area of the image is a standard gradient and the lower area is a version created with the mentioned method. To me it looks a bit more smoother seeing it from far. What do you think about this method? Was it used somewhere already – Is there a name for it? Or is it not usable because of problems with compression, post-effects or something else? [d01] Discussion: Is 32-bit color depth enough? This entry was posted in Game Art Tricks on 2. December 2015 by Simon. Awesome article as always, thank you very much. The video is, as you said very relaxing and faster so I really like the concept but I also like to read an article as it’s easier to take the time to understand. Now to answer your question: I prefer videos, almost always. For exactly the same reasons you’ve mentioned. That being said some text accompanying a video would be a big plus – links to other resources, for example. You could even add a Table of Content in the form of links your video with timestamps (so they direct to “chapters” in the video). And, although it might be to much work, what you did here: video AND an article is the most perfect form – I can watch the video to familiarize myself with the topic and when the time comes to use your article in practice I can quickly follow the text version. I hope this makes sense. I love all your posts, I think you are making a great labour finding out all these hacks. I have already read all!! I would like to ask you what do you mean by uncompressed textures, and how are GPUs are suppossed to interpolate the colours at the time they need to scale them. This means you might be able to use a small texture with a gradient and even if this texture is big on the screen you wouldn’t see big pixes or aprupt color-changes since the graphic card would interpolate the values and smooth them out. I would expect that this works better with uncompressed textures since compression artifacts could disturb the “perfect” gradient texture. I hope this was explained good enough. :,) If not, just continue asking! Ahh, alright! I tried to add a small circular gradient texture (128×128 8bits per channel png) to a poly in UE4, but the card interpolated it badly…. Feel free to attach an image of how your texture & the results looks. It sounds weird that you’ve no filtering enabled. The way you write your articles make them very easy and funny to read, I really enyoyed how you wrote the Zelda Wind Waker Guide! To be honest, for this article I did both: I first watched the video and then read the article, so, If you have the time and the energy to do both, we will probably have the time to watch and read both and you will reach more people! Very useful the video! allows me to keep working on something while listening and take periodic looks to the images when necessary, so… great! Article + video = perfect. The “just use a much bigger image” trick is actually common practice on responsive websites, to support high-dpi screens. Like, if you have a Retina display with twice the pixel density than a desktop monitor, you use a twice as large image, and then let the browser scale it down. But because of that, you get away with a much higher compression ratio. One that would make the image really ugly, if you’d look at it at a 1:1 scale. That’s interesting :) But don’t you look at it on a retina display at 1:1 scale? To have better quality PVRTC-compressed UI textures in PocketTroops we extracted alpha channel to separate texture, made it (alpha texture) twice smaller and 24bit uncompressed. That made UI look better and textures smaller at the same time, because all alpha’s are located in different R, G, B,A channels of alpha texture. You can check https://habrahabr.ru/post/259835/ it’s in russian but pictures help to understand the issue. Neat idea. So even if you’ve some compression artifacts the shape of the UI element stayed clean and sharp? Sounds great! True. This saved from artifacts on sprite borders, where alpha goes from 1 to 0. 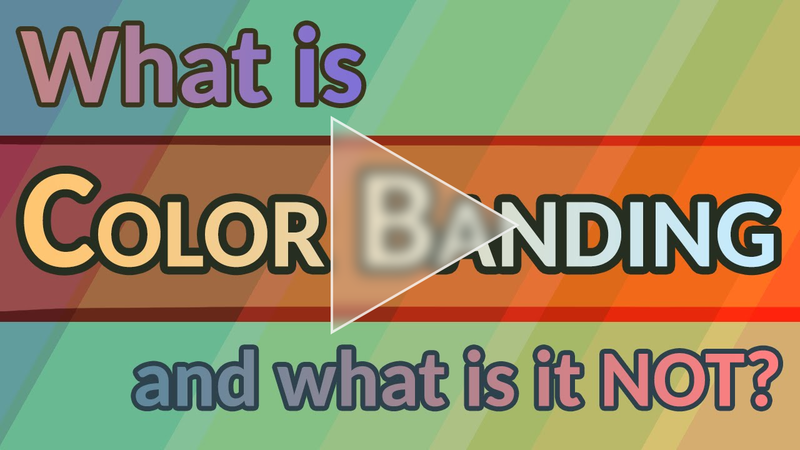 One of the things to keep in mind with banding is that there are a lot of causes, and they can work in conjunction to make banding more apparent– or sometimes they can work in conjunction to hide banding, just as dithering’s noise hides it. For instance, try opening your Homeworld picture in an image editor. Select the bright color as foreground, select the dark color as background, and create a gradient right there on top of the picture. Where did the banding go? The banding in the Homeworld picture isn’t a function of not enough colors in 32bpp. It might be a function of multiple drawing layers with gradients occurring in parallel lines. This tends to exacerbate banding. When you take an image and start to do math on it, addition and multiplication of additional layers, you accumulate rounding errors that make the final color depth much less than the color depth of any of its sources. This is why, a lot of the time you want to use buffers with much higher depth than your final output. By using 16 bit (times 4, RGBA) floating point values for computing your colors, these issues almost completely disappear, even if you’re inputting from 256 shades of each hue, and outputting to 256 shades of each hue. Thanks for your long comment! :) But I don’t understand this example: When I calculate 4^(1/2.2) I get ~1.877 – how do you end up with 5,6,7 or 8-14? Actually, I screwed up with regards to gamma. But I’ll explain anyways. 50% diffuse lighting, so your inputs are getting divided by two. 15-16->8, 13-14->7, 7-8->4. However, the technique has been around for a long time, notably on 16-bit games, to increase the extremely limited number of grays, without sacrificing colours in a limited palette: because of the low colour-depth, the off-gray colours could be used as both grey tones and as colour, depending on how they were used/dithered. This technique can be seen to great effect in the graphics of many 1990s Bitmap Brothers games, such as Speedball 2 (the best example I think, esp on Atari ST), Cadaver, Gods, and others. The technique is especially noticeable on the ST, where the palette size is further reduced. e.g. in Cadaver screenshots, notice how the same shade of green is used both to colour water and potions (and apply lighting effect), but also acts as a ‘gray’ tone in the UI and armour. Many of the colours in these games were picked to fall between the gray tones (and in some cases to fit in with colour ramps applied as key and fill-in lighting too). I remember examining the graphics from these games years ago to work out how it was done and marvelling at how clever the palette choices and artwork were… light years ahead of my own artwork where I struggled with the limited colour palettes. I like both the video and the article side-by-side. They complement each-other well. Thank you for sharing your experience and I find it to be an informative and warm presentation. I watched/listened to the video, then reviewed the article.